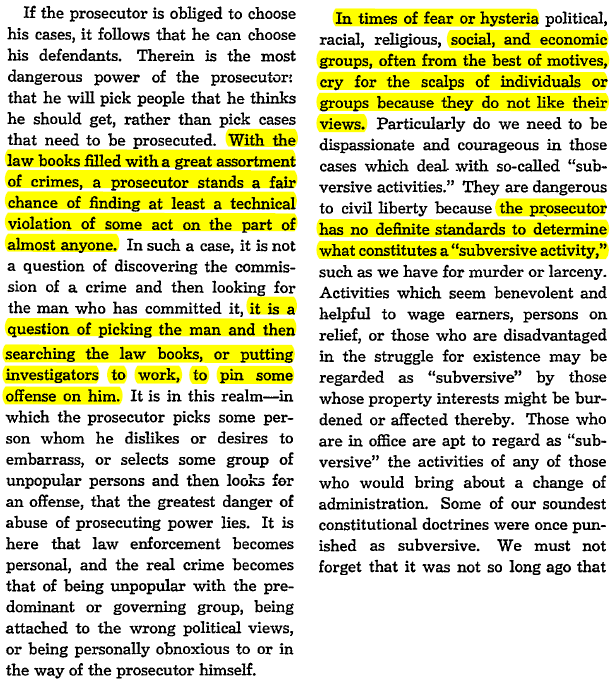 Justice Robert Jackson warned about this kind of abuse back in 1940 in his famous speech entitled, “The Federal Prosecutor” (if you haven’t read it, you should). It’s a clear violation of Constitutional rights to be harassed without reason. To find an officer attempting to justify abuse, digging deep into the code-book to find some infraction, any infraction, that might fit as a pretense, is anathema to the concept of justice. 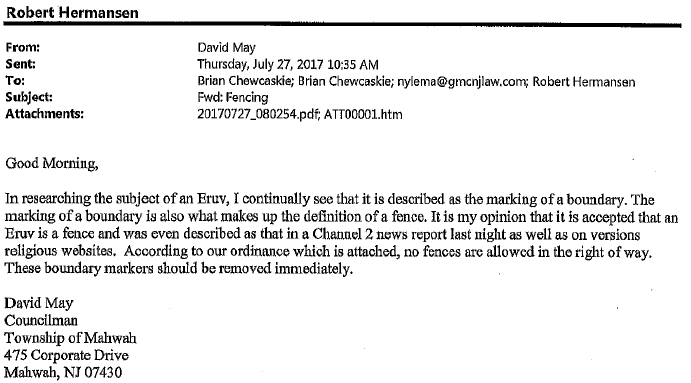 On July 21st, Mike Kelly, the zoning enforcement officer for Mahwah, sent a letter to the South Monsey Eruv Fund demanding removal of pvc piping, claiming that it constitutes a “sign“. It’s obviously not a sign. And while the zoning officer can get away with screwing up definitions as he’s likely not a lawyer, the town’s legal counsel must get more creative. Did you see it? When the town’s lawyers at Gittleman, Muhlstock & Chewcaskie sent a letter to Orange & Rockland Utilities, they tweaked the language. Instead of calling it a “sign”, the lawyers wrote that the “ordinance regarding signage” prohibits “items” and “devices and materials“. The Mahwah code in Section 24-2.2 does define signs as “any device for visual communication that is used for the purpose of bringing the subject thereof to the attention of the public.” But as we saw above, the Third Circuit clearly says that this is not an issue of visual communication and it’s certainly not for the purpose of bringing the subject to the attention of the public. So it doesn’t fit the definition of the sign? These are councilmen and they write the rules, so can’t they just change the rules to make it illegal, anyway? Council President Hermansen and May clearly feel the ban has to happen. If it takes a new law that they can then attempt to use, to make it happen, so be it. And if the council can’t use the existing code… a new ordinance! Ordinance 1812 was introduced on July 27th and was given a public hearing on August 10th (where it was tabled to get additional comments before passage). This new ordinance would amend the code and specifically ban “affixing” a “device” to any “public utility pole”. I’m sure this was in the works for years and not a reaction to a specific religious group that put up pvc poles on utility poles recently, so I won’t dwell on the coincidence of timing for the council. Here’s the relevant text of the ordinance as introduced. Ok, so the fixed up ordinance is having issues and it’s being rectified in committee. Any other suggestions? This Eruv has to be illegal. We just need to figure out how! Mr May? What do you have? David May is thinking out of the box. The Third Circuit mentions fences, so who knows? Maybe there’s another violation we can find in the code-book. 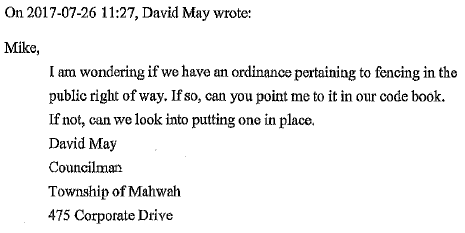 I‘m guessing the lawyers aren’t so enamored because the Council subsequently voted to issue summonses (although they haven’t actually issued), which in turn prompted the filing of a Federal Lawsuit against Mahwah currently pending in the District of New Jersey. But it’s certainly inventive (as well as instructive of their mind-frame). This is the problem Justice Jackson warned about. A town council is trying to figure out a way to make something illegal. And they are trying hard, spinning in circles as they play a twisted game of ‘pin the violation on the Eruv’. And just like the cop who violates your rights by pulling you over without a valid reason, attempting to justify it with some false pretense, the Mahwah Town Council is trying to figure out a reason to force down these pvc poles which exist all around the Country without issue. Clearly there’s more than just code enforcement in the works. In the next post, I’ll show the backdrop which will explain why this may have escalated so quickly.